In terms of wine regulations, Mount Gambier is the youngest of the six regions that make up Australia’s Limestone Coast wine zone. The first vineyards here were planted in the 1980’s, with the area being officially declared the Mount Gambier Geographical Indication in 2010. Most of Mount Gambier’s vines were planted between 2001 and 2010. The Mount Gambier GI is located in the southeast corner of the state of South Australia, bordering the state of Victoria to the west, the Coonawarra Region to the north, and the ocean to the south. The area surrounds the town of Mount Gambier as well as Mount Gambier itself. 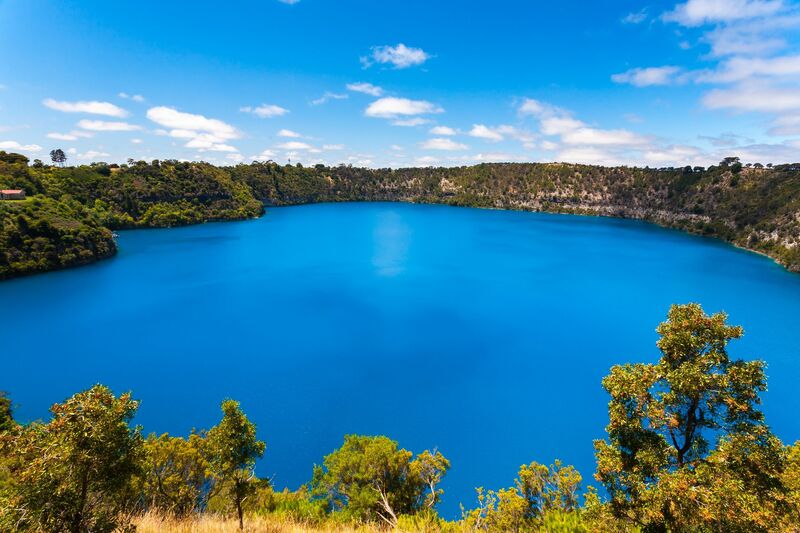 The Newer Volcanics: Mount Gambier is part of the Newer Volcanics—a chain of small volcanoes and mantle plumes formed by the East Australia Hotspot that stretches across Southeastern Australia. These volcanoes are the source of the young volcanic soils that are found in the area—in addition to the limestone formed many millennia ago. Click here to see a surprising map of Australia’s Newer Volcanics. 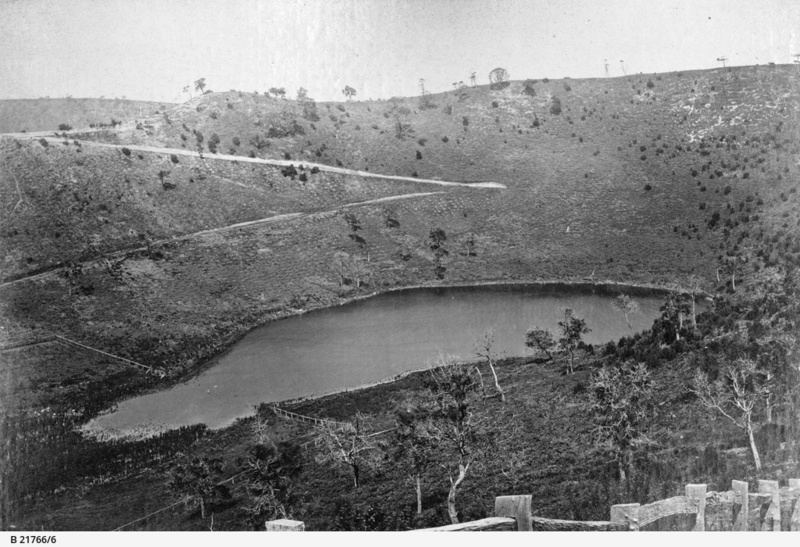 Leg of Mutton Lake: The area on and surrounding Mount Gambier (the mountain) contains four maars—volcanic craters with low rims—that have filled with rain water to become the four lakes of the area: Blue Lake, Leg of Mutton Lake, Valley Lake, and Browns Lake. Two of these, Browns Lake and Leg of Mutton Lake, have become dry in recent years due to the lowering of the water table. The irresistibly-named Leg of Mutton Lake is, as one would hope, so-called due to its shape. Both of the surviving lakes—Blue Lake and Valley Lake—are surrounded by pine trees and hiking trails despite being located just outside of the town center. Blue Lake, as its name would imply, turns a vibrant cobalt-blue color (from its more typical steely-grey) every December through May. The precise cause of the changing color is not quite agreed-upon, but most scientists believe it to be the result of the warming of the surface layers of the lake, which allows tiny crystallites of calcium carbonate (a by-product of the region’s limestone bedrock) to form. This phenomenon results in a scattering of the blue wavelengths of sunlight, creating the bright blue hue. Blue Lake is about 240 feet (73 m) deep, making the bottom of the lake itself about 98 feet (30 m) below the level of the town’s main street (Commercial Street). The Wines of the Mount Gambier GI: There are currently 470 acres (190 ha) of vines planted in the Mount Gambier GI. Of these, 66% are white grapes including Sauvignon Blanc, Chardonnay, and Pinot Gris (in that order) along with smatterings of Viognier, Riesling, and Semillon. Of the 34% of the vines that are planted to red grapes, the great majority are Pinot Noir, along with smaller amounts of Cabernet Sauvignon and Merlot. Wineries operating out of the Mount Gambier GI include Benarra Vineyards, Blue Water Wines, Caroline Hills, Herbert Vineyards and Nangwarry Station. Few if any of these wines are exported to the United States, so you’ll want to seek them out on your next trip to South Australia. Mount Gambier is located mid-way between Adelaide and Melbourne and just a day’s drive (280 miles/450 km) away from each. Halliday, James. Wine Atlas of Australia. 2014: Hardie Grant Books. Longbottom, Mardi; Maschmedt, David; and Pichler, Markus. 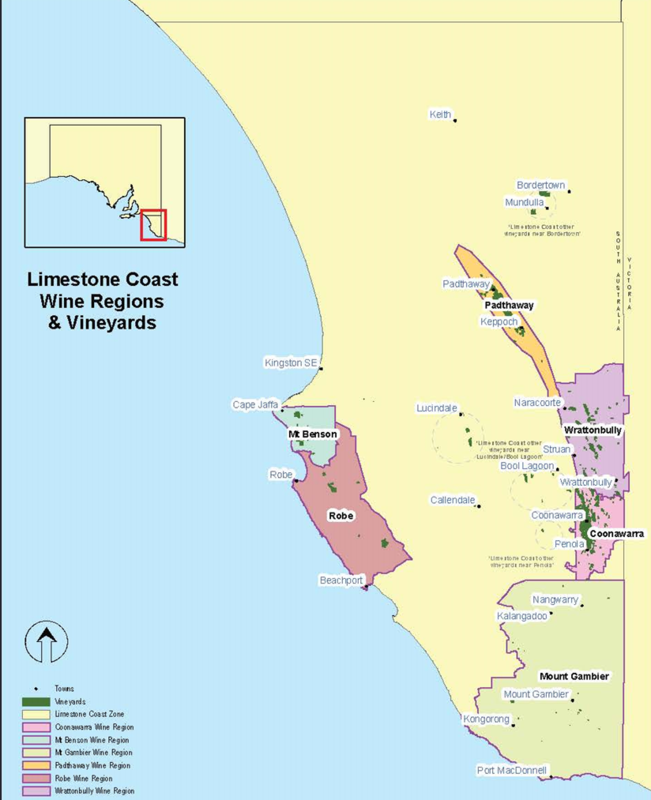 Unearthing Viticulture in the Limestone Coast: The climate, geology, soils, hydrology and environment of South Australia’s Limestone Coast. 2011: Limestone Coast Grape and Wine Industry Council.